Football fans in the English Midlands celebrated the triumph of Leicester City late Monday in what has been variously described as "one of the greatest sporting stories ever told" and a "fairytale". The club clinched the Premier League title after second-placed Tottenham Hotspur threw away a 0-2 lead to defending champions Chelsea to draw on Monday night, ensuring they would not be able to catch Leicester in the remaining two games. Leicester, who last season narrowly avoided relegation, had been 5,000/1 outsiders to lift the Premier League trophy in August. Mayor Peter Souslby was among those celebrating outside the club's King Power stadium. "We're a very proud city," he told BBC News. "2,000 years of history, we're probably the most diverse city anywhere in Europe and now incredibly proud of the achievement of our amazing football team." Former England striker Gary Lineker, who grew up in the city and began his football career at the club, told BBC Sport: "I can't think of anything that surpasses it in sporting history. It is difficult to put over in words." 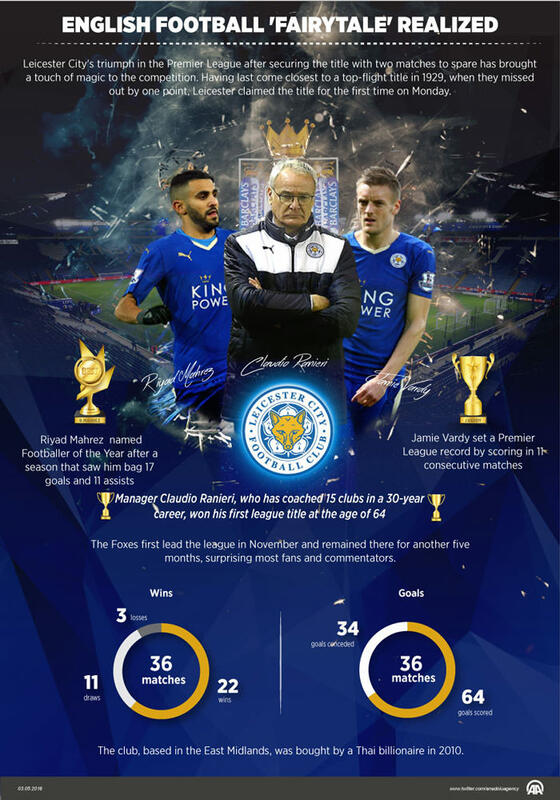 Leicester's previous highest top-flight finish was in 1929, when the team came second. This season's achievement has been portrayed as a victory of a smaller club over the financial muscle of sides such as Chelsea, Manchester United, Arsenal and Manchester City, who have dominated the Premier League since it began in 1992. Owned by Thai billionaire Vichai Srivaddhanaprabha, Leicester stand to reap further financial rewards thanks to prize money, involvement in next season's Champions League and increased ticket sales. Sports data firm Repucom has put the figure at up to 150 million pounds ($221 million).